One of my new favorite things about Summer is going to the farmer's markets on the weekends to buy beautiful, fresh produce. Someday, I'll grow more of my own veggies but even then I'll continue to enjoy going to the market and buying most of our food for the week directly from the hard-working people who grew it. I also really like the challenge of trying to eat all of the foods we buy before they go bad or the next weekend farmer's market visit rolls around. 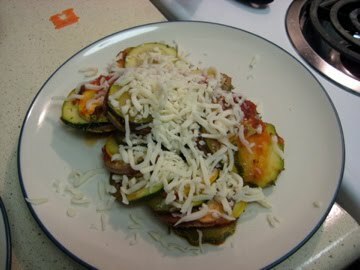 This time, I thought I'd try making ratatouille the way Remy does in the movie because it looks so beautiful and it's a great way to fill up on all those fresh veggies from the market. Coat the bottom of your pan with the pasta sauce, and then begin stacking the vegetables in long rows [or in circles if you have a round dish] alternating between the different squashes. Sprinkle the chopped garlic and herbs on top of the vegetables. Cut a piece of parchment paper to the size of your pan, and cover the veggies with it. Bake for 45 minutes or until vegetables are tender and the sauce is nice and bubbly [see photograph at top]. Serve with a sprinkle of mozzarella cheese on top [if that's how you roll]. Rachael Ray's version is a little different, as she makes her own tomato sauce and also adds potatoes to the mix. I didn't opt to use them in my recipe because I had tons of zucchini but if you've got more potatoes on hand, that might be a good stand-in for one of the other veggies I used. I also didn't happen to have any fresh herbs, but if you do that would make it even better! I think next time I'll add some mushrooms to the tomato sauce for a little more variety.